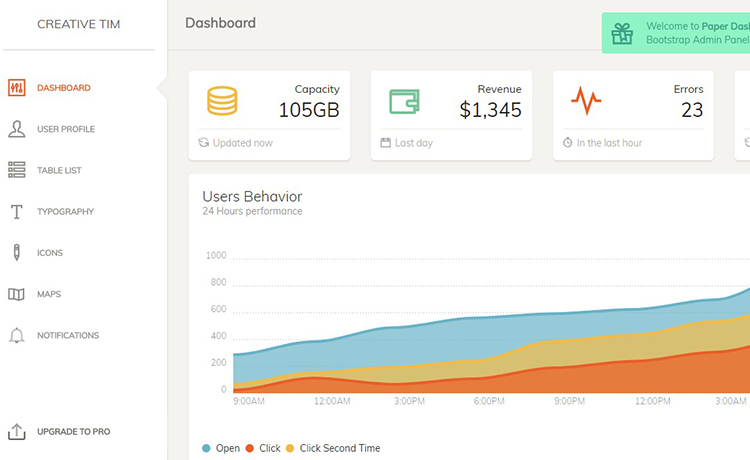 Free Responsive Admin Dashboard Template. Includes soft color, beautiful typography, spacious cards & graphics. Download for free now & Create with ease. If you’re in the development arena for some time, it isn’t rare that you have felt the necessity of an admin dashboard. A dashboard that helps run everything on the front while providing you profound control in the back-end. Now, in the past, not so long ago, people wanted to make the front side, the side which has a direct view to the mass people, look as beautiful as they can while giving a very little or almost no attention to the back side. As a result, all the admin dashboards often had a dull UI. But, now the times are changing. People not only demand a back panel which can act well but also have an exquisite look! In the consequence, today we’re presenting you a wonderful Free Responsive Admin Dashboard Template. “Paper dashboard” is not only a powerful back-end panel but also have a pleasant look as well. So, without wasting anymore time, let’s get to know a little more about this Free Responsive Admin Dashboard Template. If you want to build a solid back-end dashboard which not only hands you the power over everything on the front but also looks aesthetic, this template is for you. 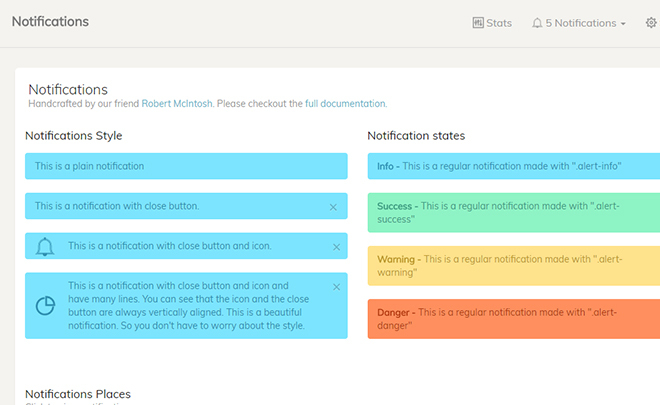 This is a Bootstrap admin panel which is coupled with pleasing colors and beautiful typography. Not only that, it contains spacious cards and graphics as well. Although it hands you total command over your website, surprisingly it’s really effortless to use and customize! It has enough features and plugins but not too much of them. Cause, too much of anything has never done any good! 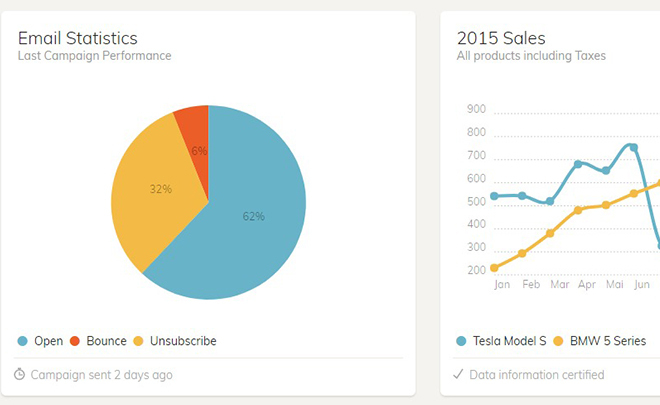 Talking of features and components, Paper Dashboard has copious of them as a free template. The free version has 16 handcrafted components paired with 4 customized plugins. Furthermore, 4 demo pages comes built-in to show how things fit together. This multi-page template has several color schemes. So, choose the one that suits you most. In addition, different beautiful notification styles, integrated google maps, handcrafted icons from Themify, Google fonts increases the usability of this Free Responsive Admin Dashboard Template to a whole new level! Having necessary bars & tables are a must for any admin panel. This admin template has two types tables. One is stripped and the other is a table on plain background. Additionally, a user profile page comes built-in. Moreover, a cool welcome message pops over every time you log in. Lastly, a toggle menu arrives when you browse from a smaller screen, isn’t that wonderful? As said earlier, people are also focusing on the UI of a back-end dashboard nowadays. So, it is equally important for an admin dashboard template to be responsive. And, when the word responsiveness shows, another word comes into our mind automatically, Twitter Bootstrap. A CSS framework, famous for making websites responsive to any device and any size! Paper Dashboard uses the awesomeness of Bootstrap v3.3.5. It ensures that your dashboard fits perfectly on any screen you might, or even, might not visit! Are you familiar with UI Kits? I guess you already are! But it’s completely okay if you’re not! Basically, it is a file with a lot of useful components important for User Interface elements or User Interface design. At Themewagon, we have several free UI Kits to offer. 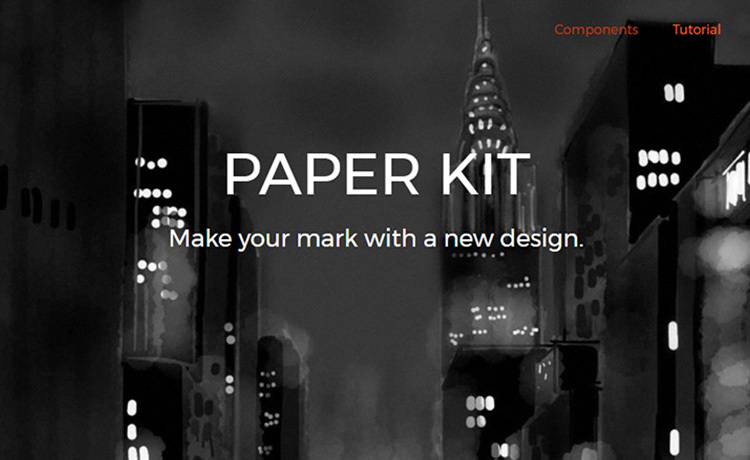 Paper Kit is amongst them. This admin dashboard template uses the same design language as Paper Kit. So, you have the flexibility to use them together or pick one of them upon your choice. It’s that much flexible and easy to use! Did you know, here at Themewagon we offer plenty more Free Templates? Make yourself comfortable exploring them. Also, some state of the earth Premium Templates are available here too! Last but not the least, we update our Blog in a regular basis. Do not forget to visit it as well. All the very best!! It is one of the best admin dashboard templates I've worked with. Sent you the download link. Hope it will help. I need this it is awesome. Are you facing any problem in downloading? I’ve sent you the link. How can I download it man? Sent you the download link. Hope it helps.